Whew. I am totally bagged – and I still have to make an attempt to study tonight! At least for a little while. The Knitter’s Frolic was awesome. Tons of familiar faces, lots to see and buy, of course! And it was certainly different to be on the vendor’s side of things for once. Both good and bad – mostly good, but the bad part: I was driving to the JCCC last night to help megan set up everything. Now, I don’t usually drive much – I like driving but hate traffic! I don’t think I get along with cars very well. Long story short, I snapped a drive belt which caused my power steering to fail. The battery light was on. I drive a minivan – the turning without power steering? Not so fun. I was close to the JCCC and managed to park in a nearby parking lot, and after setting up the booth with megan (I had to walk from my broken car to the Centre) I met up with my dad who had the car towed. Yep. This is why I don’t drive cars. I know I was vastly lucky that it happened the way it did. Fabulous. Just perfect. I love it! And quite the steal at $20 per skein for squishy handdyed superwash merino. I used 5 buttons from Earthenwood Studios to close it. It comes down to my knees, and anyone who tried it on at the Frolic will agree that it’s just super cosy and yummy to wear, but also clean and sleek looking. 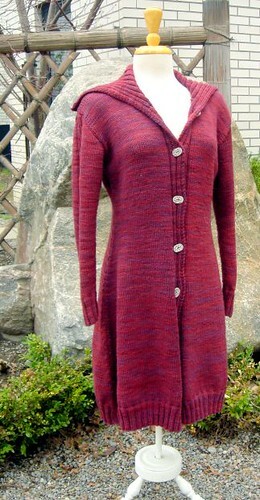 Pattern and yarn are available through lettuce knit, by emailing or phoning us at (416)203-9970, 11am-6pm EST. 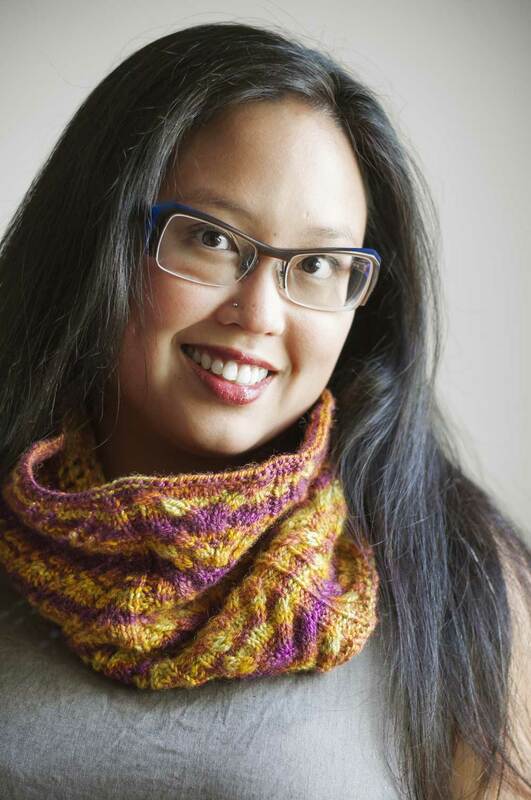 The pattern is $8, and comes in sizes 36″, 40″, and 44″, requiring 7 (7, 8 ) skeins of the Dream in Color yarn. I will wear this sweater all the time. 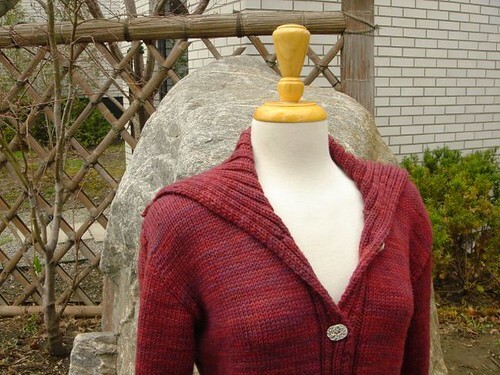 I’m already thinking about knitting another one! I am completely infatuated, must make it NOW obsessed with the Stitch Diva Hairpin Lace Skirt. I’ve got a slight step up on the technique, anyway – I’ve seen Denny do it! And I know how to single crochet, too. I am totally going to make it for my trip. Trip? Yep, I’m a-goin’ away, in a little less than a month, for two weeks. It’ll be the longest vacation (as in, away from home) that I’ve been on in more than five years – I stopped going with my parents and sisters on their summer vacations (usually to Florida) in favour of staying home in a nice big house by myself. This year, though, there’s a different plan: my sister and I shall fly down to Texas on the 20th of May, where we will stay with my cousins in Austin for about a week doing fun things – it sure looks like a fun place! Then my parents will fly down and we’ll board a Big Boat for a western caribbean cruise – Jamaica, the Caymans and Cozumel. I’m a bit apprehensive about the boat part (and the plane part, for that matter) but I’m sure it’ll be lots of fun. And there’s lots of cousins the same age to hang out with. It’s going to be a bit insane – there’s 24 people in our party! We even have a minibus booked for the trip from Houston to the port in Galveston. Anyway. That long winded description of the trip = need new hairpin skirt. This brings me to a related point: since I have decided that Maryland isn’t going to fly (REALLY can’t afford to go by myself, plus I wouldn’t be able to drive once there…so yeah, also, can’t find anyone else to go with) I have decided that I can spend whatever the hell I want at the Frolic on Saturday. a) I will spend hundreds of dollars less at the Frolic than I would at Maryland. c) since I’ll be working, that’ll offset a bit of the spending. d) I’ve made a list of stuff I want, which includes some kind of swishy drapey ribbon yarn (so not me yarn) for the skirt. Gotta go spin the water out of that completed sweatercoat!